Lot 21 is without question the most visually understated in the McTear’s April 12 Rare & Fine whisky auction. Presented in a small ceramic flagon, around a half bottle size, it could easily be overlooked and mistaken for a lesser, lower value item. 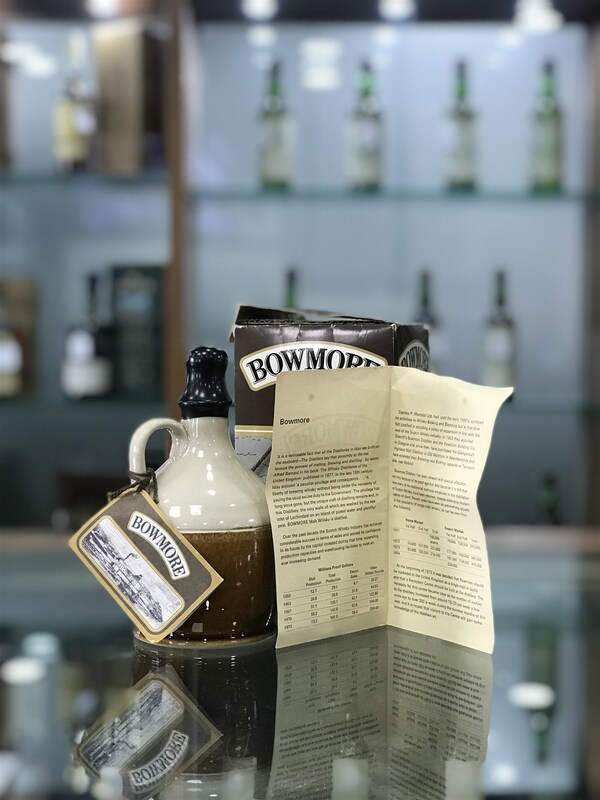 The spirit itself is in fact a fantastic Bowmore, distilled in 1955, and bottled in 1974 to celebrate the opening of the visitor’s centre at the distillery on 12 September 1974. A very limited number were produced to commemorate this event, and no doubt a number were opened and drank. Over the years due to the plain looking flagon, many would have been discarded, lost or damaged since, making these bottles incredibly rare. The condition of the lot 21 is also fantastic. The wax on these bottles is notorious for becoming cracked, and coming away. The box is still present, and there is even the information leaflet detailing Bowmore’s spirit output. This delightful little bottle is estimated to sell for £7,000-£8,000.